I feel the need to open a topic on the A330. It was long thought that Airbus would stop producing the A330/A340 family of aircraft after the launch of the A350. And indeed the production of the A340 was stopped because of the high fuel consumption, but the A330 sales had increased dramatically after the delays in introducing the Boeing 787. Nevertheless, it was expected that the sales would soon stop, with an order book that still comprises more than 300 aircraft. But now Airbus is keen to offer a new version of the A330 and announce it at Farnborough Air Show in a few days. I reproduce hereunder a few paragraphs that I have previously published in the Farnborough 2014 thread. Airbus might announce the launch of the A330neo at Farnborough and is looking for potential buyers ahead of the show. The chances have improved of securing at least two buyers. Airbus Group's board has not so far given official authorisation to start marketing the plane, but is ready to give a green light if commitments are secured for an initial order batch that some estimate between 50 and 100 aircraft. An A330neo could mean the death of the newer, but poor-selling A350-800. Possible clients include Delta Air Lines, which is shopping for as many as 50 jets, and AirAsia, which has pushed for an A330 upgrade, as well as lessors that have expressed support such as CIT and Air Lease Corp.
Reuters reported in June that Airbus was poised to launch the A330neo with Rolls-Royce as sole engine supplier. The aircraft will be offered in two versions equivalent to the two existing 253-seat and 295-seat models and offer 14-15 percent greater efficiency than the existing model. The rumours are getting stronger: the A330-800neo and A330-900neo will be upgraded versions of the A330-200 and A330-300 respectively and include some cabin improvements and 400 nautical miles more range, while Airbus will also study ways of improving the use of floor space. The new model will have at least 14 percent greater fuel efficiency and a new version (Trent 7000) of the Rolls-Royce Trent engine that already equips the B787. The A330neo will have between 252 and 306 seats, slightly more than the Boeing 787-8 or 787-9, and 10 more than the current type of A330. More carbon,plastics,.. Bigger windows, will improve the a330 by far,..
An old A330, a new engine and sell it with a new paint..
Hawaiian Airlines has declared to be interested to evaluate the A330neo as a replacement for its order of 6 A350-800 that may not be produced. Boy, you must really hate Boeing with a passion because of the 737 and 747 and the number of times they've 'stretched them out' because they were 'successful in an era'. Do you stay away from 737 and 747 flights too? Why wouldn't they work on a A350 instead of reanimating old design when the new is already arrived..
Just as the 320/737... You can't try to avoid them when flying but a more lighter,plastic,carbon... The smaller 787 equivalent should have been here already... Lighter,greener,bigger,... Etc..
Manufacturers aren't in the business of building shiny new designs for the heck of it, they're in the business of making money. So they weigh the pros and cons of all-new versus update each time. Sometimes the best way forward is going all-new, sometimes it's going for the update. While most of us aviation nuts would love to see manufacturers scrap every design each 15 years and come up with a completely new aircraft each time, it would more than likely increase ticket prices and ruin manufacturers. Sometimes the few percent in extra fuel savings an all new design would bring simply isn't worth the much longer development time, the higher unit price and the enormous financial risk an all-new design brings. teach wrote: Manufacturers aren't in the business of building shiny new designs for the heck of it, they're in the business of making money. So they weigh the pros and cons of all-new versus update each time. Sometimes the best way forward is going all-new, sometimes it's going for the update. While most of us aviation nuts would love to see manufacturers scrap every design each 15 years and come up with a completely new aircraft each time, it would more than likely increase ticket prices and ruin manufacturers. Sometimes the few percent in extra fuel savings an all new design would bring simply isn't worth the much longer development time, the higher unit price and the enormous financial risk an all-new design brings. Isn't it very strange that there is a demand for a A330NEO? They designed the A350XWB because the airlines didn't like the original A350 which was basically an A330NEO? Or is this largely due to the the timing with the financial crisis? Flying Apple wrote: Isn't it very strange that there is a demand for a A330NEO? The A333 NEO can be an excellent platform for many applications. The A358 would be more expensive to buy, is also heavier (bigger wing, bigger tail, wider but shorter fuselage) but most importantly, there are no decent A350/B787 slots available until 2022. There is no purpose for buying the A358 when you can get the much more competitive A359 at a small premium. An A330 NEO will have economics similar or better than the B788/B789 and definitely better than A358. It's also much easier to roll-over a fleet of A330's with A330NEO's. Take the example of DL. They have a bunch of B767's that will need replacing pretty soon and a whole bunch of newer A330's they got from NWA. The A358/A359 is too much aircraft and too much waiting, the B787 has a long lead time and since they already have the type in the fleet, the replacement would be very smooth. The A330NEO would be a very efficient Europe-Asia platform: it has just enough range to operate the routes reliably, and will do so very efficiently. Airbus also has 2 more markets to serve: cargo and air tankers. The NEO will extend the A330 into the late 2020's, fulfilling a market of its own, while giving the B788 and B789 a very hard time. The best thing for Airbus is to offer the exact same engine as on the A358. This would help with engine commonality for airlines who would also order the larger A359/A35J's. That way Airbus can offer a total B767 and B777 replacement package, which is a combo that many airlines use, even though most have already chosen a replacement. For me the A330NEO is 3 years late already. A first order on the launch day: Air Lease Corporation signs MoU for 25 A330neo. Building on the proven economics, versatility and high reliability of the hugely popular A330, the A330-800neo and A330-900neo launched in July 2014 will reduce fuel consumption by a further 14% per seat compared with today’s A330, making them the most cost efficient, medium range widebody aircraft on the market. As well as delivering significant fuel savings for airlines and even quieter operation, the aircraft will also expand operators’ market opportunities with a range capability increase of around 400 nautical miles while carrying more payload. Moreover, the A330neo will not only match the cash operating costs per seat of its nearest competitor, the 787, but also surpass it on direct operating costs per seat, and do so while offering an inch greater seat-width comfort in economy class. The A330neo incorporates latest generation Rolls-Royce Trent 7000 engines with a larger 112” diameter fan for a 10:1 bypass ratio, more seats and new cabin features. In addition, aerodynamic efficiency enhancements, including composite ‘A350 XWB inspired’ winglets and a wing span extension from 60.3m to 64m, will together confer increased lift and reduced drag. First deliveries of the newest A330 Family members are scheduled to start in Q4 2017. Through an innovative use of the cabin space, the A330-900neo will accommodate up to 10 additional seats (from 300 to 310), while the A330-800neo will seat up to six additional passengers (from 246 to 252) – and retain the same high comfort standard as today’s A330, with 18-inch wide seats in economy class. Moreover, all passengers will enjoy a 21st century on-board experience, including 4th-generation high-definition in-flight entertainment (IFE), full connectivity plus the same full-LED mood-lighting as in the A330’s big brother – the A350 XWB. The LED cabin lighting will be lighter and cheaper to maintain than traditional illumination while offering unlimited mood-lighting customisation scenarios. Cabin crew in the A330neo will benefit too with a cabin intercommunication data system (CIDS) upgrade, featuring a new flight attendant panel to control the mood lighting, water levels, temperatures and voice announcements. In addition, the galley insert developed for the A350 XWB will be available for the A330 and will include an espresso coffee maker, chillers, and ovens with baking functions. Pilots and cabin crew alike will also appreciate the new segregated lower-deck mobile crew-rest. This also frees-up more space on the main deck for extra passenger capacity. As well as having operational commonality with other members of the Airbus Family – including the same pilot type rating as the A330, common type rating with the A350 XWB and the same “Code-E” gate category as the A330-200 and -300 – the NEO will also retain 95% airframe spares commonality with A330 and inherit its marketing-leading reliability. 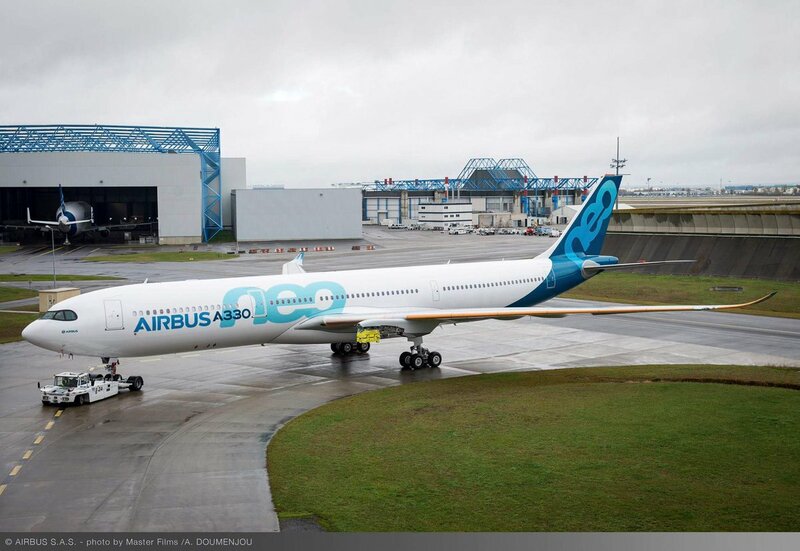 It will also offer five percent reduced airframe maintenance costs, thanks to further evolution in the already efficient A330 scheduled maintenance programme, now with fewer tasks, longer intervals between some checks, as well as a reduction in manhours over the typical 12-year maintenance cycle for new parts such as the engine pylons and some sections of the improved wing. Also helping to achieve the five percent reduction in maintenance costs is the new electrical bleed air system (EBAS) which replaces pneumatic controls with full electrical regulation – a technology which is already proven on the A380 and also features on the A350. Overall the new A330neo builds on the A330 market leadership, in efficiency, versatility, reliability and profitability, and is the perfect choice for airlines. sn26567 wrote: A first order on the launch day: Air Lease Corporation signs MoU for 25 A330neo. Seems they also ordered 60 A321neo. I have the same impression: A350 was a NEO A330 and was rejected by gurus and some airlines, others were willing to buy. A350 became XWB (whole new design going head to head with 777 and putting last nails in coffin of A340). Now A330 NEO is back by popular demand I asume. Some airlines will have lost years due to this. Hawaiian Airlines has signed a memorandum of understanding with Airbus for six A330-800neo aircraft. The new commitment replaces a previous order for six A350 XWB-800s, which were due for delivery from 2017. Hawaiian Airline’s existing orders include an additional four new A330-200s for delivery by 2015 and 16 narrowbody A321neo aircraft, scheduled for delivery starting in 2017. Another A358 order cancelled, that probably means the final nail in the coffin of this model. AirAsia X (Malaysia) cancelled 12 A330s on order with Airbus, which were to be delivered in 2016 to 2018. Three remain on order, with one to be delivered in September 2015 and two in 2016, ahead of a first batch of A330-900neos from late 2018. CES received on Friday their 50 th A330, making them the biggest 330 operator in the world. First Airbus A330neo, reg. F-WTTN. Expected to enter service in March 2018 with TAP. sn26567 wrote: First Airbus A330neo, reg. F-WTTN. Expected to enter service in March 2018 with TAM.